After spending several hours on the deck at Dornan's, overlooking the Snake River and the Tetons, and salivating over the wine selection at Dornan's wine store (a very impressive, and reasonably priced selection - too bad I couldn't indulge), Paul, and his friends, Coban and Dave, called. Turns out that we spent a lovely, and low keyed afternoon and evening together wandering around the Tetons, and then parked at the Jackson Lake Lodge. Dave and Coban drove a leased Z3 out to Jackson (a long story - but, basically, the lease is coming up and there were miles to burn). . . So, I must admit that it was fun to jump in the "SAG" and drive the Z3, with top down, through the Tetons. J None of us moved much once we got to the lodge, though, in early evening, those guys went for a walk, and I chose a snooze, and to make a couple of calls, on a bench overlooking the lake and the mountains. Turns out that we hung out and wandered around all day, enjoying the time we had to spend together. Decided not to spend the night at the lodge (wouldn't have been worth it), so we all, including John, spent the night at Colter campground up north. All of my gear was down with the Cycle America folks in Jackson Hole, but, I've learned to be a minimalist. A borrowed jacket, and sleeping bag, along with the back seat of a car, was really all I needed. Hmmm, not quite the afternoon/night of lodge luxury and solitude, but I wouldn't have changed it for the world. It was great. . . and I'm sorry to leave these guys behind. And, thanks, Paul, for continuing to gloat that you don't have to be on your bike tomorrow!! Gosh, another 7 weeks of this really is seeming like a long time. John still is wondering whether I'm going to bag it. If it was just me, I think that I would. However, I can't quite formulate the email I'd write to the donors, whom, among us all, have contributed over $40K for breast cancer research, explaining that I'm off the trip after just 2 weeks. Guess I'll just have to keep pedaling for week 3. Since I spent the night up by Jackson Lake with John and Paul, as well as Coban and Dave (friends of Paul's (and mine) from California), this morning I joined the Cycle America group in route. Paul and I said our good-byes at the Colter campground just north of the Jackson Lake lodge, and John and I said our good-byes after a wonderfully tempting breakfast buffet at the Jackson Lake Lodge. (Unfortunately, since I had to get back on the bike today, I couldn't really enjoy the fabulous breakfast buffet, overlooking the Tetons - bummer.) John was off to catch a flight back home, and Paul, along with Dave and Coban, to explore Yellowstone. It was sad to say good-bye to John and Paul, and also sad to see the rest day/night come to an end. It's not that I'm in pain, or sore, it's just that it's getting a tad tiring to be up at the crack of dawn every morning and spend hours and hours on the bike - on a schedule. Basically, I think the back to back cycling has really caught up with me. My body is fatigued. I want to sleep late, nap in the afternoon, and get to hang out in these neat towns. It'd also be a total blast to hang with Coban, Dave, and Paul and play in Yellowstone, and then head to Jackson Hole for the 4th. Nonetheless, despite sleeping in the car - and, thanks, Dave, for lending me your sleeping bag - I was pretty rested, and not terribly unexcited about riding. John drove me to Jackson Lake Lodge, where my bike spent the last day and a half, and we shared a nice, and very very civilized breakfast, though mine consisted of oatmeal and a peanut butter and jelly sandwich on whole wheat bread, along with some fruit and coffee. If you haven't been to the lodge, it is truly an amazing, amazing place. Frank and Karen were right. The 60 foot windows on the second floor overlook Jackson Lake and the Tetons, and the only view that rivals, though not surpasses it, of which I'm aware, is the view from the Ahwahnee Hotel in Yosemite. To me, there is something magical about water and mountains; perhaps that's why I loved Alaska so much. However, in some ways, Jackson Lake is even better because (a) it's not thousands of miles away, and (b) the weather. And, the Tetons hold a special magic as they just pop out of the ground. Along with the wildflowers, this view is amazing. I hope to be back someday to really explore the area. I can honestly say that is now one of my favorite places in the world. Majestic. Magical. I will be back. I wasn't certain of the route Cycle America was taking today. But, similar to Alaska, there just aren't that many roads to Dubois. In fact, there's one. So, despite John's proclaimed, "I want to be at Jackson Lake Lodge by 7, for breakfast and a photo shoot," we didn't leave Colter Campground until 7. Surprisingly, or perhaps luckily, it turns out that within five miles I was on the course route. The morning was spectacular as we were treated to more views of the Tetons. The view that captured my heart the most, perhaps, is the view from Oxbow Lake. The bright blue sky, the moon, the snow-capped peaks, the green grass, purple and yellow wildflowers, and the reflection of the mountains in the lake was pretty unbelievable. As Robin and Brian suggested, throughout the first miles of the ride, I continually turned around to gaze at the Tetons behind me. Unbelievable; I have to come back. 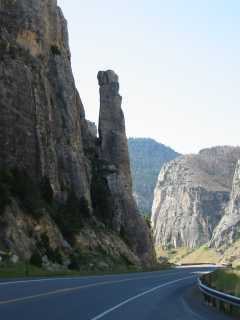 In addition to the stunning vistas of the Tetons, the other remarkable thing about today's route was the change in scenery. The day started, and continued until the Divide, with snow capped peaks, brilliant green mountain and hillsides, and a ton of wildflowers. 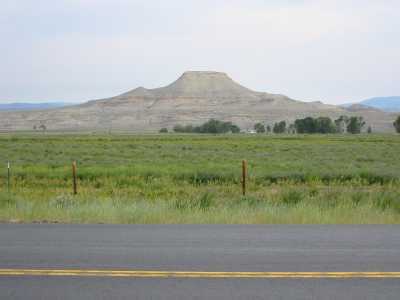 After the pass and the Divide, however, the landscape changed to a very barren one, with rust colored soil, and, to the badlands. Hot, barren, desolate. Yes, friends, this must be Wyoming. Hard to believe that we're in the same state as Jackson Hole. While I wouldn't want to live here, or perhaps even visit for any length of time, it is pretty neat to see the barren landscape, and experience the hot dry winds. Despite having both my duffel bags in my tent, which aren't light, and staking down the tent, I must admit I'm a tad concerned about whether my tent will become an unidentified flying object. It is also a little scary to think about what's ahead with respect to the landscape. Re the almost eaten bug - I wish I could master what I did today. Somehow some bug, larger than a mosquito, as well as crunchier than a mosquito, flew into my mouth but, luckily, somehow, I managed to spit it out. Previously, this nutritious snack snuck down my throat, involuntarily, and without me knowing it, until it was too late. This time, though, for the bug and me, it was blender time.... And, both of us survived. Hmmmm.. I arrived into camp pretty early this afternoon, around 3, and decided to get my laundry done. It's one thing to wear a T-shirt or a pair of shorts twice (or thrice), but wearing dirty bike clothes is pretty nasty. So, as I sit in the laundry mat awaiting the dryer to complete its work, I feel like I'm 17 again and back at camp. This is especially so since I got to walk next door for a local ice cream. Moose nuggets - Yumm! They were also sweet enough to let me charge my phone battery. Tonight should be pretty mellow - I plan to go to bed early, and try to get some sleep. This week holds the most elevation of any week on the trip, and isn't too light on miles either. I'm pretty intimidated about what is going to be thrown at us, particularly if the winds aren't kind to us. And, the hardest day of the whole trip (elevation gain combined with miles) is July 5. Wonderful - the day after the 4th! It's only, though 5 more riding days until the next day off at Devil's Tower, and then, another week of climbing in South Dakota before hitting some of the flatlands. We'll probably yearn for hills before long; but, for now, the flats are sounding pretty appealing. Dinner was good, and it was good to be back with the group. It seems weird, and strange, though, not to run into Paul or John. I keep expecting to see them at the ice cream shop, dinner, or the bar. I guess I'll need to wait a few weeks until they come back. I'm camped out here, post dinner, at the Rustic Pine Bar in Dubois (pronounced, as taught to me by Robin and Brian: De-Boys, Wyoming!) drinking a diet 7up. (Somehow, I don't need more dehydration.) Tonight all the dude ranches come into town, and the Rustic Town Bar for the weekly square dance. It'd be fun to check this out; but, quite frankly, I just don't have the energy. Given that I 'partied' last night, or shall I say stayed up to the late hour of 11, I really need to get some sleep. As I was sitting here typing away, a guy came up to me and said, 'nice bike'. Good pick up line, eh? Somehow, these cowboy hats just don't do it for me. I wasn't particularly interested in having a conversation 'cause I wanted to get this written and to bed, however, he seemed as if he knew a bit about bikes, and the area. I asked him what brought him from Chicago to Wyoming - his response? A bankruptcy and a divorce, in '93. He said he owned the bike shop across the street. He also claimed to be Bob Schwinn, one of the Schwinn brothers, and a 10% owner. He proceeded to ask me if I was all equipped, or whether I needed anything. I said I was all set - but then remembered my tire/wheel issue. Turns out he had metal tire levers, and wouldn't let me pay for them. . . Wow! So, hopefully, I'll be all set for my next flat! And, he also provided me with the quote of the day, "Great place to make a life; horrible place to make a living." To my girl scout buddies - OK, Carolyn, I think you're right. We'll have to choose our destination carefully, but I do think it'd be fun to check out a dude ranch sometime!! Left around 6:30 this am as breakfast wasn't quite ready, and I wanted to get some mileage under me prior to the heat kicking in. This, combined with not liking to eat first thing in the morning, inspired me to skip breakfast, and eat along the road. Good move. Knocked the first 23 miles out pretty quickly, and enjoyed a great breakfast in the non-thriving metropolis of Shoshoni. Had a pancake, larger than I could imagine, or eat, along with irresistible country ham. I knew the latter was a gamble, and yes, I tasted it for the next 30 miles. MMMM, in case you're curious, country ham is best the first time around, no the second, third, fifth, or. . . . But, it was good - and, all for the low price of $4.35 (including a cup of coffee). Rode the next 30 miles with Tom, Jim and Lauri, and really enjoyed it. There were rollers, but, either yesterday's easy day, the massage I received last week, or the fact that my legs have finally kicked in, allowed me to enjoy the morning. I felt good; and, a 100% mood change! Or, maybe it was the tailwinds. 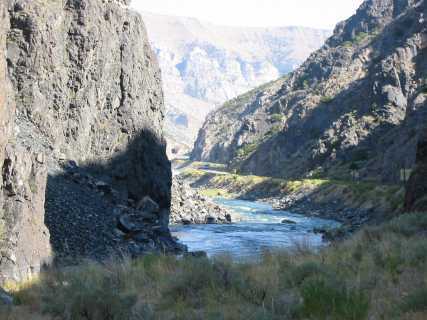 . . or the incredible Wind River Canyon. Whatever it was, though, I was pretty psyched to be on the bike, pedaling away. The afternoon was fine, except for the heat. 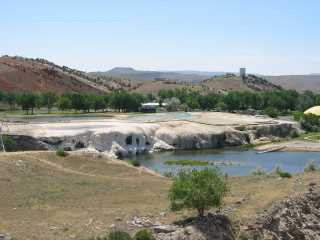 The town of Thermopolis (gotta love that name) would have, under normal circumstances, been worth a visit, as they boast the purportedly largest mineral springs in the world (dubious, though cool looking) and the Wyoming Dinosaur Park, where, supposedly, a dig was happening. The hot springs would have been fun to go into, but the air temps were pushing 100. . . .Hot, hot, hot! I now remember why I left the east coast and moved to Alaska. I don't like heat. Wanted to get to Worland. All in all, though, for some reason, I finished the day feeling pretty strong. Folks went to McDonalds for ice cream - -I couldn't bear that thought, though I did hang out with them at mickeydees. Wouldn't it be disappointing if the best ice cream I could find was at McDonalds. Perhaps I'll have to have it once, just to refresh my memory of how 'good' it is. But, no worries, there have been some great spots along the way! Afterwards, I explored town, and found the one open restaurant/bar. I was craving the hamburger I didn't eat at lunch (lunch was a great bbque - but I knew I wouldn't be able to stomach a hamburger in this heat with this kind of riding) - so I ordered a pre dinner appetizer of hamburger and salad. Yes, no wonder I don't think I'm losing any weight on this trip. Tomorrow is the intimidating day - I thought it was 8-9k of climbing, but it turns out that it's 'only' 6800 ft and 91 miles (basically, the Sierra Century I did in early June). 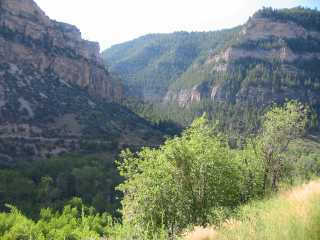 . . it's over the big horn mountains; and, basically, if I make it through manyana, I'll make it through the trip, barring an injury. I'm planning on starting early in order to beat the heat, and, if necessary, which it'll probably be, take all day. It's supposed to be beautiful. . . and, wouldn't it be great if I ended up being able to complete it, and feel reasonable. . . .Then, after South Dakota, it should be relatively flat until we hit upstate NY. So, I'm off to try and get a quick 15 minute leg massage, and then, hopefully, to rest and sleep. Early morning wake up call of 4:30 and hoping to be on the road by 5 or 5:15. I was hoping for a 4th of July celebration, but this town is closed down. The next town, Ten Sleep (one has to wonder from where these names come) over (20 miles) has the rodeo and fireworks, but that's a tad too far to go for the evening. Bummer. I am, though, hoping to bag a rodeo before the west is conquered. OK, so it's the day of reckoning. If I can make it through today, I will make it across the country, and EFI (anyone yet figured out what this stands for??). I left early today, wanted to beat the heat, and know that I'd make it in before dark. As Lauri said, what's one day, we can do anything that's thrown at us for one day. Right she is. The first 26 miles were supposed to be flat. Hmmm, wonder what the day's router was thinking when he wrote that. Rolling hills probably sported 2000 feet of climbing or so. Up, down, up, down. . . total desolation. Looks like oil country, which, indeed it is. No trees. Guardrail provided some coverage for the pee break. Gotta take what you can get. Made it to Ten Sleep for a great pancake w/maple syrup, pb and j and yogurt. Fuel for climbing. No messing around with something that's not tried and true. 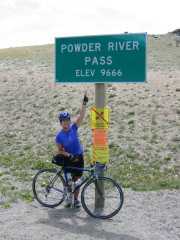 After all, it's 30 miles of climbing, from Ten Sleep, to Powder River Pass at elevation 9666. Yes, climbers, this means nothing too steep. OK, great, great views. 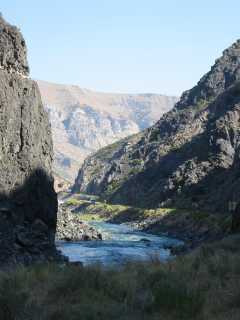 Beautiful canyons. Climb not too bad, though the heat was hot. (Are you tired of me saying this yet? I'm tired of feeling it; so, there!) I felt pretty good, and pretty strong, given that this is supposed to be the toughest day. Basically, the climb is similar in grade to Mt Hamilton, Mt Shasta or Spooner Lake for you California folks. It's a tad longer, and at a higher elevation. Whoo Hoo. Hung out in some fields of lupine. Just can't get over these. Wow! On the way up to the pass, ran into Jennie, a fellow Californian, who, unfortunately, got dehydrated. Pulled over to the side of the road to help her out - uh oh - the tar, on the shoulder, was melting. Jenny was going to be ok, and the SAG would pick her up. However, my tires got, literally, a half inch or tar on them, and my cleats had lots of tar too. Yikes. One could view the tar on the tires as anti-flat protectors, but it made for an uneven ride. Hmmm, wish I had my swiss army knife. 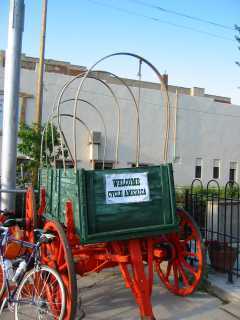 Instead, twigs, tire irons and stones, along with some arm muscle and more patience than I had in the heat, enabled me to put the bike, and my cleats, back in pedaling condition. As I approached the summit, tears suddenly overwhelmed me. They came from nowhere - perhaps a sense of relief, astonishment that my body was holding out (I had a flashback to my days in a wheelchair after double knee surgery in 10th grade), a sense of accomplishment, a sense of hope for our country, and an overwhelming sense of love from the family of friends who have helped contribute over $40K to breast cancer research, and all those that have reached out to be a part of this journey. Unreal. I hiked up to the top of the mountain, hung out for a half hour or so, and then spent another half hour or so in the most amazing field of lupine yet. Of course, there were the obligatory pictures of me at the pass too. Yahoo!!!!! Great 4 mile descent. The world is good. One would think that the day should be over. . . but, no, not yet. The next 20 miles, which were supposed to merely hold rollers for us, turned out to be more than rollers. 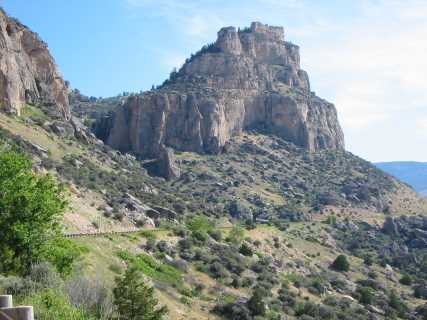 As one person described it, you'd descend 1000 feet only to climb another 800 feet. Man oh man. At mile 75 or so I really started to get annoyed... others had other words to describe these ups and downs. Thankfully, though, at mile 76, and the last water stop, the Cycle America folks treated us with some snacks (some food was good), which gave me the strength to conquer whatever else the Big Horn Mountains had in store for me today. I started to fear the downhill because you knew there was going to be an uphill to slap you in the face. Finally, at mile 87, the Big Horn Mountains treated us with a view of the valley, and sights of what must be the town of Buffalo below. I started the final ascent and final miles to town. Fun descent!! Couldn't hit my 51.6 mph record I hit during week 1, but did hit some great speeds. Spent most of the riding day riding solo, just as I wanted it. Lots of time to think and to ponder. The Rockies are now behind us. Wow. What a great day. Upon arrival in town, I checked out Surreys, the old fashioned soda shop that locals at the pass told me about. Had a scoop of ice cream which tasted delicious, but won't make the top 10 list. Mail call again (thanks Liz and Barb), showered, set up the tent. . . . .and, dinner, at the wonderful occidental hotel and saloon. 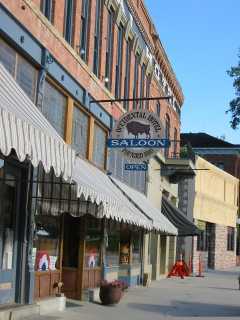 Buffalo WY is a place I'd come back to to spend some time, and I'd stay at the Occidental Hotel. Of course, spirits were high this evening at the sense of accomplishment. We all felt that if we managed today, the rest of the trip is downhill - figuratively, not literally. I think it was a tad overhyped; but, better overhyped then underhyped. Most of us managed pretty well, though one person did end up in the hospital that evening from overhydration, heat exhaustion, etc. . . thankfully, she had an amazingly quick recovery and, after one day's rest, she was on the bike again. The Occidental hired a band for us - and, actually, it wasn't country and western. Two acoustic guitarists. . . after hanging out in the park a bit and catching up on the phone with a few folks, I meandered over. Talked with some locals who informed me that the local spirit was choke cherry daquiries. Now that I could handle. Lauri and I enjoyed ours, as well as our conversation on 99 ways to pee! (BTW, peed outside the tent last night. Need to master the peeing barefoot. I did, though, remember to pee on a downhill slope, though). Also, story from Darby: Three guys joined us last week for Montana. We called them the 'heat' as they all seemed like overeager/overanxious cops, though 2 of them were 'prosecutors' and 1 a sales guy. At Bud and Shirleys in Darby, MT, one of the DA's (as I would call them, but prosecutors as they call themselves) engaged this scruffy looking dude in a conversation. Finally, the conversation turned to where they were from. The scruffy looking dude mumbled some sort of unintelligible answer when the "Heat" guy said, "C'mon, everyone's gotta be from somewhere." Finally, the guy replied, "Well, I've been hiding out in Eastern Washington for the last 10-15 years." Thankfully, the Heat member which was present was a bit more seasoned then the other Heat dude... otherwise, the wild west would likely have experienced another shoot out. Stats: Interstate Hwy 90, all day. What fun! We cycled through the Powder River Valley which, purportedly, according to the WY Point of Interest Sign at our picnic stop, produces 1/6 of the world's power. Hmmm,,,,we're all getting pretty skeptical of local places' proclamations for being the largest, the best the . . .. . . anyway, picnic stop at exit 88, and home for the night, Gillette, at exit 124. Yep, never thought I'd be counting exits on this trip! But, similar to the road of life, even the highway of life, it's the people that make it interesting. Was fortunate to cycle the afternoon with Jim and Lauri from Iowa, Tom from SoCal, and Diane, also from SoCal. Lauri and Jim taught us the game of hink pink, hinky pinky, and hinkity pinky. Certainly kept us occupied for a number of miles. Oh yea, and the peeing. . . nary a guardrail. We're getting good at this! J might need some re-acclamation lessons prior to re-entering society this august. Let's see, what else? Oh yea, learned that if I pour water on myself, I immediately reduce my body temperature (very important in 95-100 degree heat), but, oops, my bike shorts are wet. Ok, you ask. What's wrong with wet bike shorts? Ask one of your cycling buddies - check out the diaper in the crotch (used for padding and to reduce saddle soreness). Ahhh, it's not just babies that dislike wet diapers; we adults dislike it too! And, unlike cycling jerseys, the shorts don't dry nearly as quickly. Yep, a bit of chafing. Hmmm..
My MO is turning out to be that once I arrive in town, I check out a local ice cream stop, watering hole, or something. Gillette didn't have much to offer in the way of ice cream, but I did find a local watering hole - Mingles. 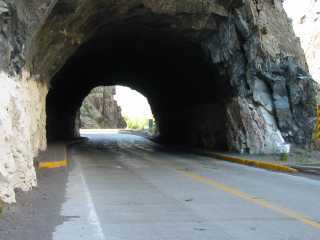 It looked like a pretty tough place, and I was still in my cycling clothes (if I were to say biking clothes, folks would assume I was a harley gal). I leaned my bike up against the tv across from the bar when a biking dude inquired whether I was going to lock it to the tv. I responded no, unless they thought I needed to. They told me no. We then talked about what kind of beer they'd recommend. I had a local wheat beer, though only a half a glass. Too dehydrated, and an order of wings. It's amazing, these two biker dudes, and their girlfriends, wives, or whatever, came up to me and started talking. Without fail, walking into places, alone, in cycling clothes, breaks down barriers, and people are people. I need to learn not to judge by looks, because so many times I have been wrong about folks. It's a lesson we could all learn. These guys were fantastic, sweet, interesting, and kind. And, on top of that, gave me a tip to the emporium, the place tied for first for the best ice cream. 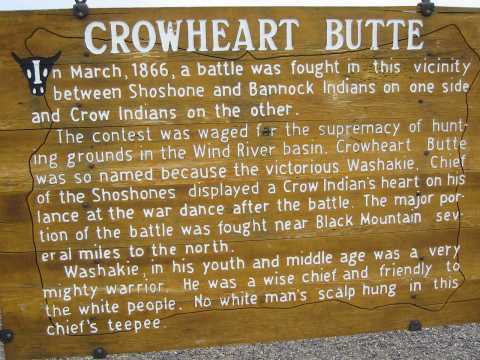 (Near devils' tower. ) Wouldn't have found it, but for their recommendation. And, you know what? The bartender learned that I was riding across the country, as a fundraiser for breast cancer research, and wouldn't let me buy my wings or beer. Funny of the day: Had another thunder/rainstorm last night. I awoke and closed the windows. Normal, eh? But, after the hard day's ride, Tom was so tired that he dreamed he was sleeping on a beach and he was merely being sprayed with ocean waves. Upon awaking, though, he tried to figure out why he was soaking wet. Those SoCal boys! Thankfully, not our sag wagon. The morning was a 100% treat. Side and quiet roads, good pavement, no wind, light rollers, farmland... Come to think of it, last night was a 100% treat too, even though it was awards night. (A post humous award was given to Paul by Ken from Oregon for climbing the Virginia City climb 2 _ times (the one that nearly killed me) as well as Teton Pass twice (I missed that climb b/c of the Yellowstone deviation). It was the first night where I felt like I had time. And, the gym rats (I sleep outside in my tent, along with a number of folks, while lots of other folks choose to sleep inside in gyms) had to deal with the equivalent to a sprinkler going off. Hah! Yep, for some reason, the fire alarms went off a number of times.... .all I needed to do was to pop in my ear plugs! The lunch stop came early again. . . my helmet makes for a perfect pillow, so I took a nice little rest prior to starting out for the afternoon. 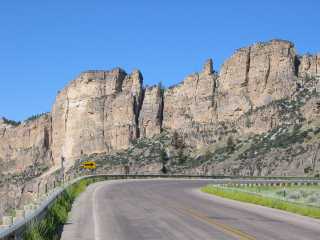 And, of course, in Wyoming, we're either going uphill, or we're battling headwinds, sometimes both. This afternoon was no different, as we were treated to some of both. Cycled the afternoon with lauri and jim, as well as brian, and a little bit with josh. 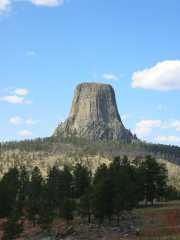 I actually won our bet as to when we'd spot devils' tower (at mile 54, I bet 50). Yep, we come up with silly things to keep us going. It is a pretty bizarre looking structure. The ice cream at the Emporium was a total treat! Even though we only had 6 miles to the end, 2 of them were supposed to be climbs, with some parts steep. Usually I won't indulge in dairy while riding, but I couldn't pass up the rec given to me at Mingles last night. Yum! Not too sweet, great consistency, stored well. Local equivalent of moose tracks (vanilla base, chocolate chips, carmalized peanuts). So, it's ok that the town store in Carlisle was closed! All in all, I'm feeling good, and enjoying every moment (well perhaps not the moments that are climbing moments in heat). This is how I hoped I'd feel. I think (hope!) the body's adjusted to the exercise, and the routine has been established. Thankfully, I made it through the end of week 2, and beginning of week 3. I know the people, and am comfortable. It's really a great group of folks, interesting, smart, and kind. No real jerks (at least not that I discovered.) It's still really fun and interesting to get to know folks. There are plenty of people that, while I may have met everyone, I don't know everyone. And, on a bike, there can be plenty of time to talk and visit and learn. So, it's just great to ride up to, or sit down to dinner with, folks you don't know well. (For instance, as I did a couple of nights ago at dinner with Mick -- a fellow traveler, one of the staff and a brit. We were talking about our travels to fun, interesting, or exotic places) This is FUN!